One can use instead of the chlorides the corresponding oxides/hydroxides. 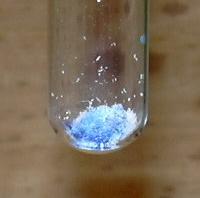 If one uses silicon dioxide instead of aluminum chloride smalt results, boric acid also yields a colorant. One adds in a test tube two spatula-tips of aluminum chloride(hexahydrate) and one spatula-tipful of cobalt(hexahydrate) and mixes them by swaying the tube back and forth. Vigorously heat the mixture with the burner. There is soon formed, beginning at seperate points, a strong deep blue coloration, water and hydrochloride acid are vaporized. Dispose of the residue as solid heavy metal waste.